Have a fintastic time at a Shark themed birthday party. This listing is for a set of table signs to add a custom touch to your child's birthday party. Includes 4 signs and a thank you favor tag. ►PDF and JPEG files of PRINTABLE table signs and favor tag. This listing is for a DIGITAL file. No printed items will be mailed to you. This Listing is NOT customized. Download includes a zip folder. You must be able to access zip folders in order to access all files. 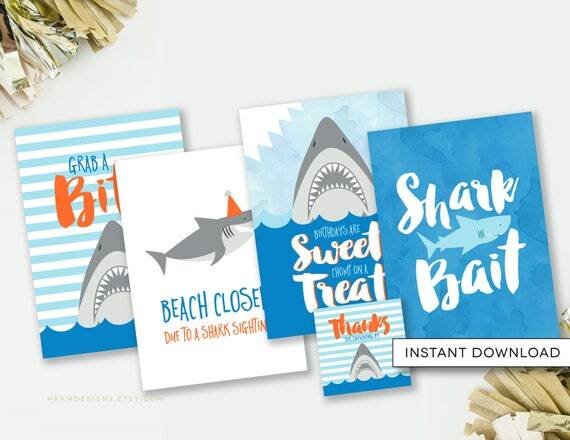 Includes: Birthdays are Sweet, Grab a Bite, Shark Bait, Beach Closed signs in 5x7" and 4x6" sizes. Also includes Favor Tag (2.5"). ►If you need to download your order again, files can be found under: Your Account - Purchases & Reviews - "Download Files"